American pro goalie Val Henderson is playing in Sweden this fall. 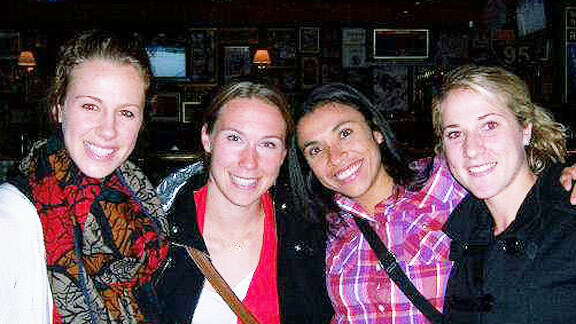 She contributes occasional stories to espnW about what life is like playing overseas. The Swedish Damallsvenskan is respected as one of the top-three women's professional soccer leagues in the world along with the American-based WPS and German Bundesliga. Yet despite its quality, the league is not actually fully professional. Across the board, players are either in school or have part- or full-time jobs in addition to soccer careers. Whether as teachers, psychologists, radio talk show hosts or administrative assistants, most of these players have to make their living off the pitch. Contracts in the semi-professional league are private, so exact numbers for pay are unknown, but a working range is believed to be around 1,000-1,200 euro ($1,373-$1,648) per month. A player who makes 2,000 euro ($2,747) per month is expected to concentrate on soccer and not work a second job. So the question must be asked: How is the soccer affected when you have to work on the side? Can you work another job and still perform at your best on the field? Does the semi-professional status hurt the quality of the league? I talked to a variety of my teammates from KIF Örebro to find out. 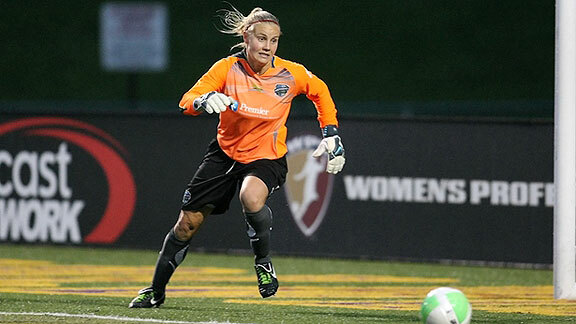 Elin Magnusson has been playing with the club for 12 years and is a cornerstone of the organization. She also works 25 hours a week as a high school teacher. She often rushes to practice straight from work, quickly changing from slacks and dress shoes to shorts and cleats. It's not easy balancing work and soccer. "It is stressful to have two arenas where you have to perform," Magnusson said. "Especially when people around me [her boss at the school, for example] don't look at my soccer as a job." She feels having a second job helps keep her focused and balanced, but it's definitely not ideal. "I would love [to be] playing soccer full time," she said. "I would definitely sleep more and be less stressed. I'd probably do one more extra session per week and have better routines for rehab and physical training. "If all players on KIF had soccer as a full-time profession, we could live soccer more and do more things as a team. Players would have more time to rest and be better prepared for practice and train harder and more effectively." Sara Larsson, starting centerback for the Swedish national team and a former WPS player is a perfect example of what Magnusson refers to as "living soccer." She plays solely for the club without any fixed obligations off the field. It is a definite advantage. "I can focus and commit 100 percent to my soccer," Larsson said. "I can eat and rest exactly when I want to. I don't need to stress to get to practice on time. I can do my rehab and weights and extra sessions easily." While she finds not working benefits her game, she doesn't think part-time work has to jeopardize performance. "For sure it would help KIF if more players worked or studied less," Larsson said. "People would come more focused and be able to perform better. But you can work a lot and still manage to improve. It's up to the player to be a pro and make soccer come first. People should be 'on' every practice." Finnish defender Susanna Lehtinen finds that working actually helps her be "on" every practice. For her, adding a part-time job, 20 hours per week for an IT company, has actually improved her game. "When I first moved to Sweden I came as a professional player with the ambition to focus solely on soccer," Lehtinen said. "After three months, I was bored and unhappy with my daily life. Practice takes, max, four hours per day, and for me, it's not enough. With my job, it is easier for me to focus at practice, since it is still the highlight of the day. Soccer is my No. 1 priority and I consider it my profession, but now I have a balance. I come in a good mood, which improves my performance." Not every player has the luxury of working part time and choosing her own hours, however. Olina Vidarsdottir, an Icelandic national team member and leftback for KIF, now works 40 hours a week as a psychologist. Last year, when KIF asked if she could get a job to help supplement her income from the club, she began full time at Universitetssjukhuset, Örebro University's hospital. "I wasn't ready to start my career, but I didn't want to just get a job at ICA [the supermarket]," she said. "Now soccer is really important, but my job is important, too." Vidarsdottir still stands out on the field, starting for KIF and posing a threat on both offense and defense, but she knows her soccer is affected. "I don't think I'm as fit as last year," she said. "I've only been to the gym a handful of times. I want to go more, but I work from 8 a.m. to 4:15 p.m., and then we have practice. Am I supposed to go after? "Sometimes I just can't give more [at practice]. After working all day, I don't always have the energy. I'm still just as competitive and want to do my best, but it's really difficult." While Vidarsdottir drops down to working 80 percent of the time during season, she still has a lot on her plate. She, like the other players, appreciates having something she can do outside of soccer, but having to work so much is not the ideal solution. Ultimately, players find a way to make it work if they want to make it work, but there is no doubt the soccer sometimes suffers as a result of their outside jobs. I can't help but conclude a league that can fully support its players financially has a decisive advantage over one that cannot. A former Academic All-American at UCLA, Valerie Henderson is a freelance writer and professional soccer player from Orinda, California. She has played in the WPS for three years, helping her team to the championship game in each of her seasons.